When I have a chance to go to the YMCA in Bear I like to go in the youth wellness center. They give you blue cards and show you different exercises. I like to play the activities with other kids, too. I know it has been hot out and so it’s not as fun running around outside, but it’s still important. On Mother’s Day my Mom said she wanted to delivery some Brae’s Brown Bags to the Emmanuel Dining Room. Really I thought she would want to take a break, but it was important to her. So we brought 60 bags to the soup kitchen. 10 of the bags were child bags and we put books and also the bubble fruit flavored toothpaste from the travel size donations my dentist gave us. We ran out of kid bags, there were a lot of kids there on Sunday. There were grown ups who asked for toothpaste also so I need to remember that for next time. Maybe if we have extra we can put them in more of the bags. The LEAD 360 Challenge with the Jefferson Awards is still going through public voting of the top 27 finalists across the nation. I have been trying to remind people they can vote every 24 hours. So I thought I would say it on here, too. It’s easy to vote. You click the link and click the orange button that says vote, that’s all. Also you should look at the other finalists, too because all of them are doing really good things for people, animals and the earth. Coming up I am participating at the University of Delaware’s Day of Service. I will have a table. I got an email from a girl named Amanda who is part of Alpha Phi Omega. She said it would be nice if I could come. I will bring the display I used at Ag Day. Very fun news! I hope I can register to run/walk this event, but even if I can’t I’ll still be there to cheer on everyone and to let people know what Brae’s Brown Bags is all about. Every year I run the Delaware Mud Run, Jr. and it is very fun, but it is not a full 5K so this race might be a little bit harder for me. I think it is really cool that there is a race for 3B. I want to thank all of the students and people involved with helping to get this race put together. 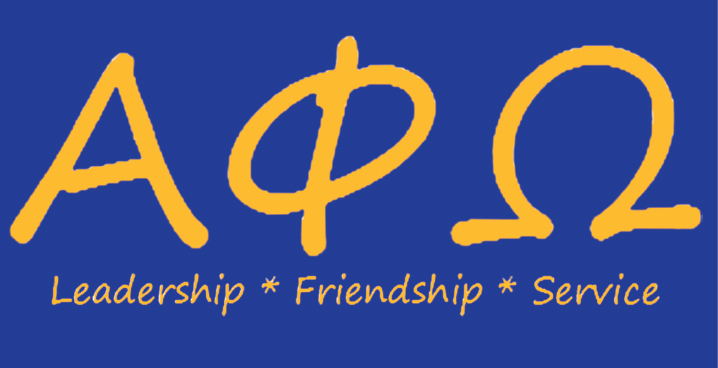 Alpha Phi Omega, they are just really the best people ever. Registration is open now and you can register online, through the mail or in person. All of the information can be found on the Races2Run website. The race will be April 27, 2014 at the University of Delaware and registration begins at 1pm but the race begins at 2pm. My Mom made a graphic for me to put on my 3B Facebook page and I thought maybe if you want you can also use it to help get the word out about the race. I’m hosting a smaller race event at my school on April 11th but it is only open to students there so I’m really happy that Alpha Phi Omega has made this possible for everyone to be able to participate. I have a table/exhibit at Ag Day on Saturday, April 26th from 10 until 4 also so it’s going to be a very busy weekend. It would be great if you guys could go to one or both of those events to help support 3B. My brother, sister, Mom and I went to Family Promise of Delaware off St. James Church Road on Saturday. We met with Ms. Cheryl there in July and she let us know a little bit about what Family Promise does and how it offers shelter to whole families instead of just women and children. So on Saturday I brought 69 of the “Workforce” bags to Family Promise. It was good to see Ms. Cheryl again and she was very happy by all the bags I brought. They included toothbrushes, toothpaste, deodorant, one water bottle, one healthy snack and then some of them also included gloves, soaps and scarves. Most of these items were donated to 3B by the UD Chapter of Alpha Phi Omega and also by the Appleby Family. Ms. Liz works with my Mom. So thank you to Ms. Cheryl for having me back to Family Promise. Thank you to APO for all your donations and thank you to the Appleby Family for the soap and scarves! Do you see all these cool people in the photo? 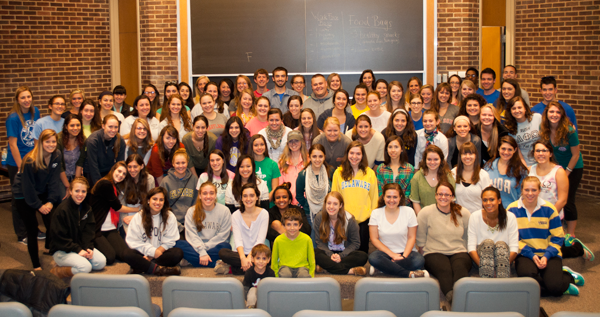 Those are my new friends, also known as, Alpha Phi Omega at the University of Delaware. Mr. Kyle said that around 90 people helped out with our first joint 3B bag packing event. 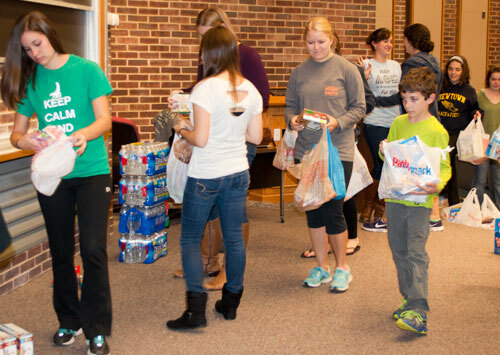 Their fraternity collected $1,000 worth of items to put in my Brae’s Brown Bags. 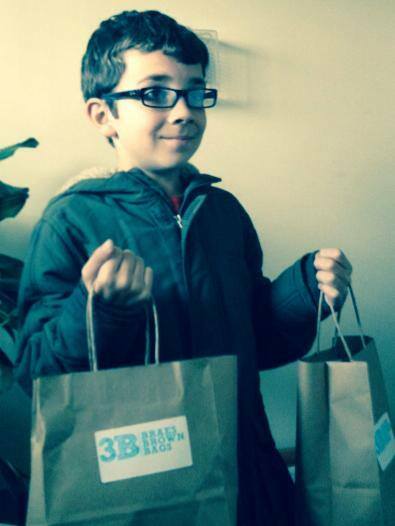 We made our first workforce bags which included the toiletry items: toothbrush, toothpaste and travel size deodorants. There were 70 workforce bags made and I hope to give them to the Family Promise organization but I need to get them all together with inserts first. We also packed 179 regular Brae’s Brown Bags, but I’m going to turn 30 of those into children bags where I will add a book for a school-aged person and I will be giving those bags to my school district, the Christina School District, this coming Friday so they can be handed out for Thanksgiving to some families in need. My brother, my Mom and my Gram and Pop Pop all came to the event. 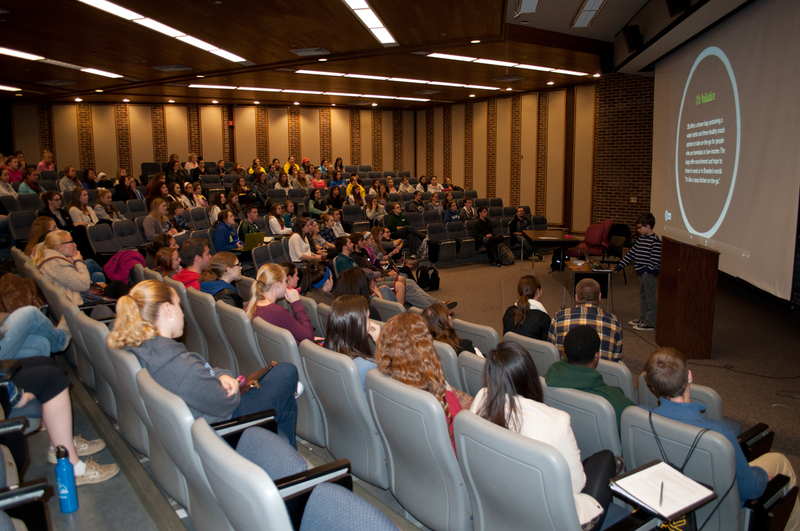 It was in the same room where I gave a speech a couple of weeks ago in Purnell Hall. One of the girls who is in Alpha Phi Omega, I don’t remember her name, but she gave me a fist bump! The whole afternoon was really great. It was kind of crazy with a lot of people but it was also really good because all of those people came to help. When we went outside to pack the car with the bags we had to put some of them into my Gram and Pop Pop’s car because Mommy’s Jeep ran out of room. Next up I will be going to Philadelphia to the Fox News station to be on the Good Day Philadelphia Morning Show on Tuesday, November 26, 2013! Be sure to watch! You might have seen this announcement on Facebook yesterday, but just in case you have not I thought I would also mention this great news on my blog. A service fraternity, Alpha Phi Omega at the University of Delaware, sent my Mom an email yesterday to let us know that 3B will be their philanthropy for this school year. Their fraternity chapter has said they will be collecting food and holding bag packing events for 3B so we can reach even more people! 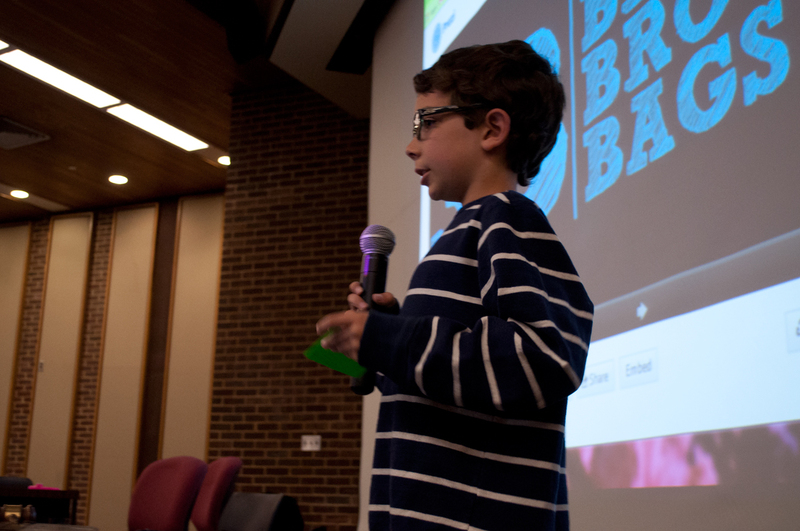 It is so very cool to know students at the University of Delaware are excited about Brae’s Brown Bags and they want to help my project be even more successful. I’m very happy they like the idea. I can’t wait to have my first meeting with them so I can show them my presentation and meet everyone! You can find APO at UD on Facebook, too.